The day started out clear and brisk with a slight breeze in the air. 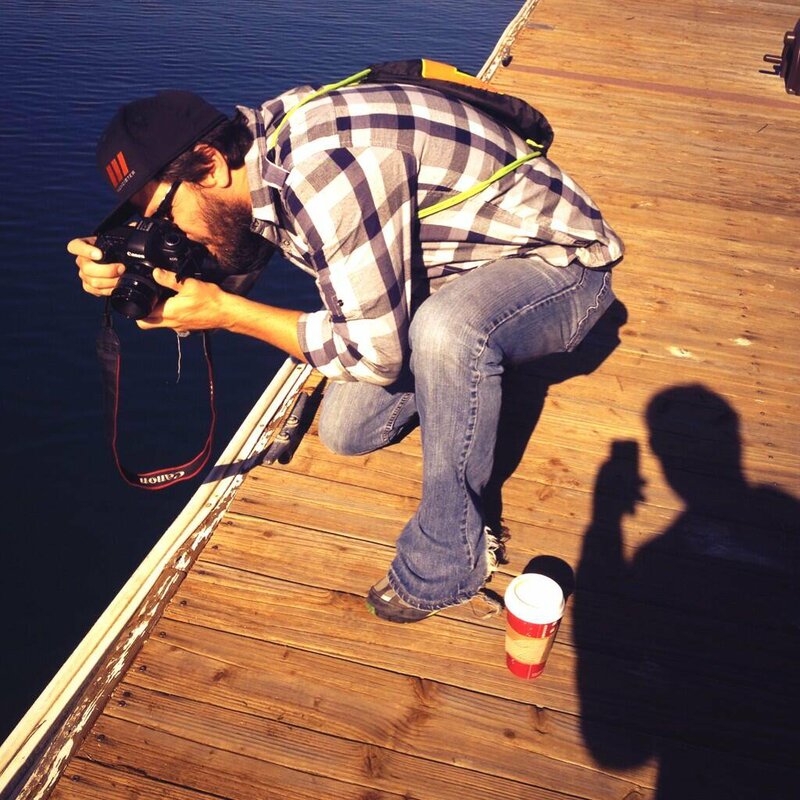 Eric and I met at Starbucks in Marina Pacifica, right on the edge of the water near some boat docks. It really couldn’t have been a better day to be outside. We grabbed a coffee and the top paper in the stand and got our inspiration word for the day: seized. To take possession of. To become stuck or jammed, as in a machine. To have possession of. Inspired by “seized” we knew what we had to do. Off we went in search of something that has taken possession of something else. Or we could stop something in motion, seizing it in time through photograph. We had to search the area around us to see what we had to work with. We found some bushes with leaves unable to move, being caught in a spider’s web. We captured this a few different ways with the sun glistening in the webs. Down to the docks we went where we were actually greeted by exactly what you would expect: water and boats. Not much else. No action on a Tuesday morning. Nothing moving except the breeze which is hard to see, much less photograph. We had to figure out something so we went around a corner to see what other docks would hold for us. We came across an older gentleman washing his boat. Water drops were getting blown from the spray of his hose. Time to seize those drops. After spending some time capturing the spraying water, we knew we needed other options so we went down the docks to see what else we could find. 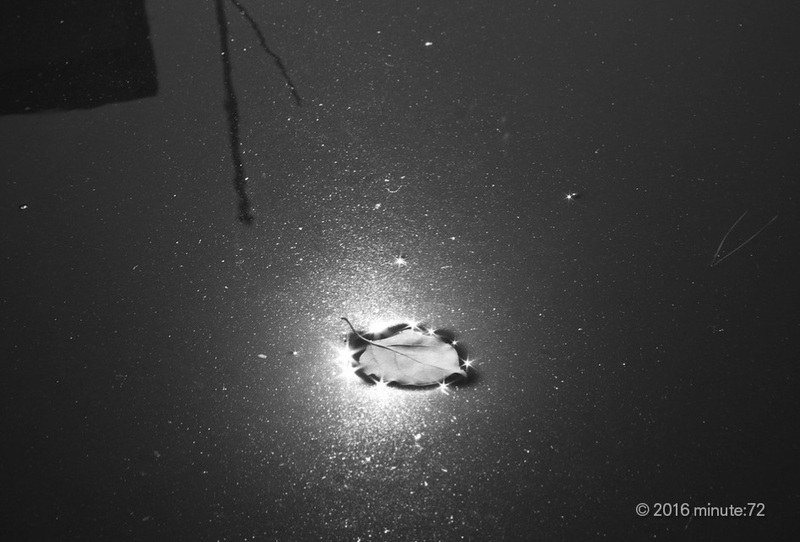 The sun’s reflections on the water yielded some interesting shots but nothing was saying “seized” just yet. Until: one leaf floated down in front of us. The surface of the water immediately stopped its downward motion and held it on its surface. It was interesting to us how the surface tension just stopped it from sinking or moving from the wind: it seemed like it just stopped in time. This morning we knew we were going to meet, but with our schedules being busy lately, the time and place weren’t set in stone. So I headed to work down the coast and told Eric to call me when he was ready, and wherever I was when he called, I would pull into the nearest Starbucks and wait for him. I received his call as I was heading out of Seal Beach, and knew that the next Starbucks was in Sunset Beach where we did our very first minute:72. So I headed into Sunset Beach and waited – but only for a couple minutes because he was just right behind me. Until now, we had done pretty good finding a new location each time we met – something we try to keep different so that we would have to work within different environments. But today we both didn’t have much time and we knew we wanted to get in another 72 minutes, so we had to revisit a previous location to fit it in our schedules. The word today was “speaker”. It seems that nouns are a little harder to explore since they are pretty definite in their meaning. A loudspeaker. A person who speaks formally. Originally I had thought that revisiting a location would give us an advantage since we already had been there and had scouted what was around, but because the inspiration word (speaker) was so different from last time (inventing) it turned out that we still found ourselves stumped at first. The only speaker nearby was an outdoor speaker on the Starbucks that wasn’t anything special. So we decided to walk and scout again with the word “speaker” in our minds. We were coming up empty handed. There were no other speakers to be found – no audio speakers and nobody on their soapbox. As we talked, we found that our conversation turned from what a speaker is to what a speaker does. What is the purpose of one? What around us can show a message being projected, but then also being received by another? It seemed to get harder and harder as all we had to look at were weathered beach houses, cars cruising past us and the occasional passerby staring at us and wondering what were up to. As we walked, we came across an out-of-place patch of flowers on the side of a parking lot. Within this patch there were tiny flowers and a few bees gathering their pollen. As we witnessed that, I told Eric about a story I heard on NPR the previous week (read or listen to it here) where scientists just found out that bees are not only drawn to the shapes and colors of flowers, but they also can sense an electric charge that they give off and are drawn to. As I told him this story, we both looked at the flowers and noticed their speaker-like shape and the way they spoke to the bee in their own way and how the bee responded to them. We instantly knew this illustrated our concept, so now we had to capture that. 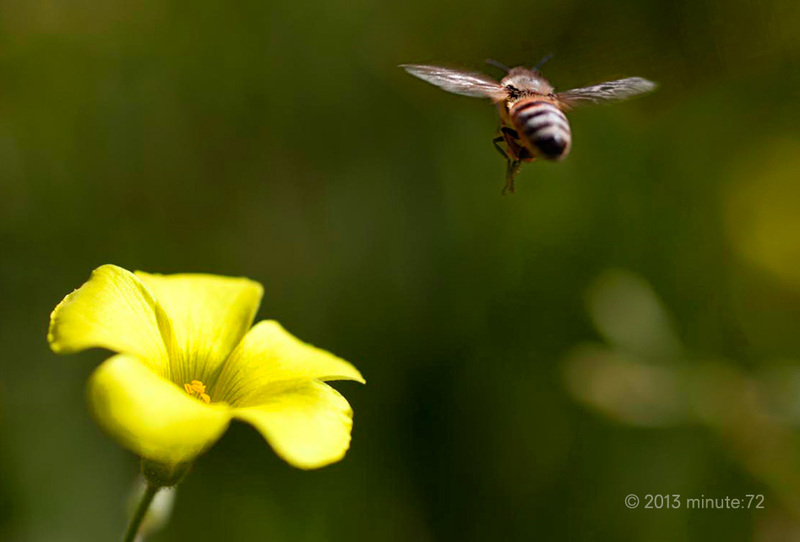 I asked Eric if he could capture a close-up of a bee coming in to a flower. Eric, as always, was game and said that he never tried that before. So for the next 15 minutes, which was all the time that was left, he followed bees around trying to anticipate their next move. It turned out harder than we thought since focus, unpredictable flight paths and how close he was to the bee made capturing the right image very difficult within such a short amount of time. Many photos were captured within that last 15 minutes. After going through all the photos, there was one image that stood out and spoke to us. One lone plant proclaiming its message through its trumpet-like flower as loud and brilliantly as it could and one bee listening to that message and responding by coming in to take it up on its call. Yesterday was a rainy day and we weren’t sure if today was going to be dry or not. But we still kept our date to meet and do another minute:72. When we set out to do minute:72 we told ourselves that even though weather might not look good, we had to stick to our plan and we needed to deal with whatever came our way. Planning was something that we wanted to try and avoid so that we could rely solely on our creative instincts. We met at the Starbucks at 7th and Park in Long Beach, right across from Recreation Park. I wore some crummy shoes because after the last minute:72, I didn’t know if I was going to be picking up trash like last time or stomping through mud from yesterday’s rain. The word we were given was weather. It was a pretty good word since Long Beach actually got some action in its weather the day before. As we had done in the past, the first thing we did was turn on our iPhones and check for any meanings of the word we didn’t initially think of and then the weather report. It was 52 degrees and sunny. Rain water was still puddled on the ground, and although the sun was as bright as ever, there was still a crisp in the air from the winter storm that just passed through – for Long Beach, it was what we consider chilly. We kicked around what we should shoot – the sun, the puddles, something that had been weathered as a result of time or the elements. Although we knew we would shoot all of these things we could find, we also wanted to try and capture what the weather at the moment felt like to us. So off we went. We shot a lot. The Sun. Lingering rain drops on leaves. Puddles. The morning dew on the grass. The wet sand at the nearby lagoon. Found objects that had been left behind. Paint that had been cracked by too much sun over the years. All of these things said weather in one way or another, but they didn’t capture how the weather felt to us at that moment – except for one. There was one shot that came about by chance. 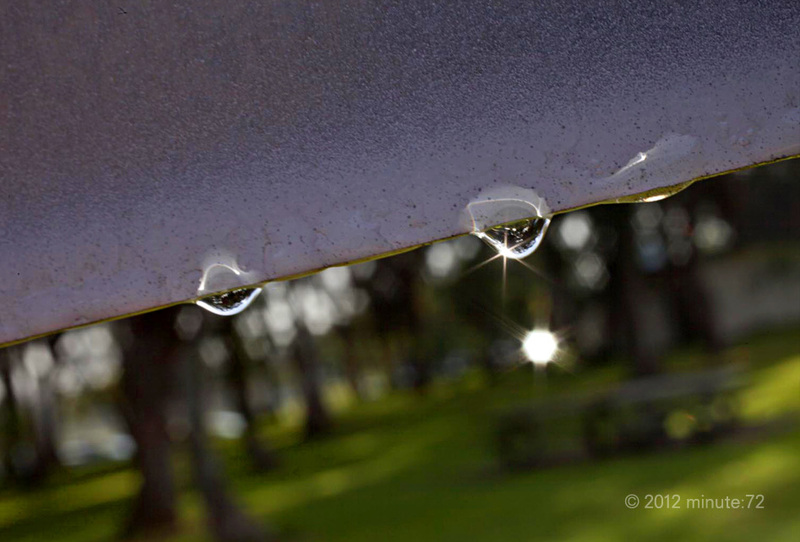 A shot that was supposed to be solely focused on a drop of rain water hanging on the bottom edge of a sign in the park. The background was supposed to be nondescript and blurred so all the focus was on that single drop. Instead the background in this one shot could be seen more than what was intended. You can tell that the park beyond is still wet since the sign is still dripping. My old shoes were testament to this as they were plenty saturated from trudging across the wet grass. The glistening sun reflects the clarity of the sky but takes a back seat to the crispness in the single drop of water. And there is something about the metal sign and the way it cuts across the image with its cold grey textured finish. It almost seems as if it has goose bumps from the lingering chill. This shot captures how the weather felt to us this morning.